Another fan palm endemic to Hawaii is the Mt. ‘Eke Pritchardia (Pritchardia forbesiana.) It is also called Forbes’s Loulu. 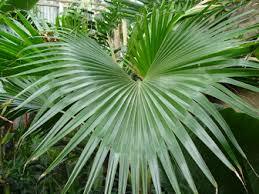 It is a medium sized palm with average height between 15 and 30 feet, with wavy leaves and many hairs at the base of the leaf stalk. This palm is native to the island of Maui, and is found only on Mt. ‘Eke in the Honokohau drainage in West Maui. It’s conservation status remains as Endangered, however some populations are recovering in areas where feral pigs have been eradicated. More work must be done to help save this species for future generations, and the Merwin Conservancy hopes to soon add specimens of this rare native Pritchardia to our collection.